Great. Do I want to equip it? Err, maybe? 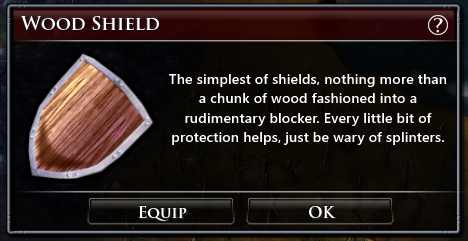 Nope, I don’t want to equip it, as it stops me using my two handed magical staff. 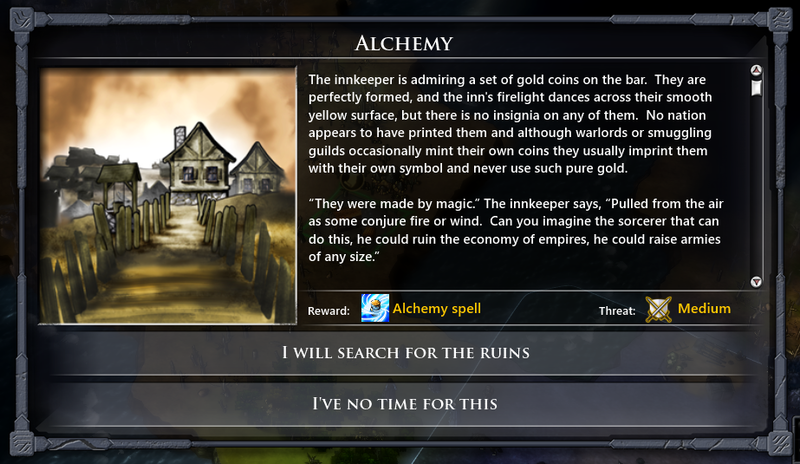 While exploring, I stumble across my first question: alchemy. It’s basically the same as all the other quests: go somewhere and kill some things. I can barely even bring myself to read the small print. Again, as with recruiting your first hero, this appears to be a non-choice: there appears to be no negative consequence to turning down a question versus accepting a quest but not actually carrying it. Hence, I just accept, and then treat the quest marker in the same way as any of the wander monsters on the map: go kill them when you’re strong enough and got nothing more pressing to do. In my case, thanks to my warg, I can go do that straight away. The fact that they are air shrills plays no part in my tactics. Click on warg. Send warg to eat enemy. Repeat. Maybe I should just auto-complete all these battles? Although, then I get no control over what happens, and does it not somewhat defeat the point of the game design? At least both my heroes gained a level. So I take adventurer’s boon for Nabeanice (+8 hit points), and boringly, give Miredesi that useful looking potential I. My reward for completing the quest is the alchemy spell (turns mana into gold). 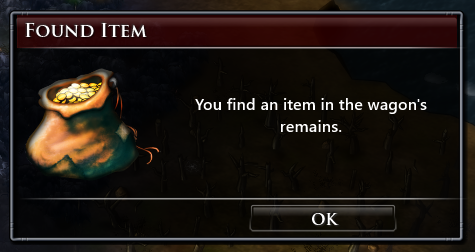 I guess that could prove useful. With the building of an outpost, my empire now has access to iron and an air magic shard. And weirdly, a few turns after founding it, a magical being pops into existence. I guess I must of missed a notification or something, as when I first saw it, I thought it was going to destroy my newly founded outpost! Anyway, mustn’t grumble: free magical demons have to be a good thing right? Its a flying bird daemon thing! After defeating a wandering troll, my two heroes level up again and I assign Nabeanice to the path of the mage, and Miredesi to the path of the governor. My army also picks up a pet wolf called Anna, who hopefully won’t cause problems with the warg. And Nabeanice finds a nifty flaming dagger and an iron shield. South from Hagdast I find a couple more city spots, one of which even has some essence slots, so I order some pioneers to be trained in my capital once they finish the pier they’re currently working on. 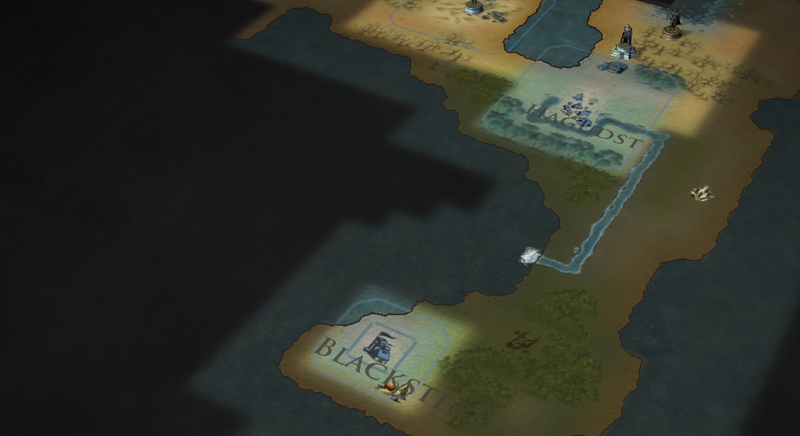 A few turns later, and Blackstead, the sister settlement to Hagdast, is founded. I make use of the essence slots immediately, casting oppression (which, weirdly, reduces unrest) and meditation (which gives me more mana per turn). Seems like a weird combination. I guess the meditation helps the citizens put up with the daily oppression. This entry was posted in Elemental, Fallen Enchantress.